I’m not sure if you’ve heard, but fall marks the (unofficial) start of the slow-cooker season. Yep, with the cooler temps and shorter days, comfort foods like stews and hearty soups become a staple in the American diet, and slow-cookers are an easy, delicious and time-saving way to create these savory meals. But today’s slow-cookers are a far cry from the originals that, while great, were missing a lot of the convenient bells and whistles you can get today. But, which of these modernized successors is the slow-cooker for you? We’ve got some of 2017’s best slow cookers to help you find the one that’s right for you. This slow-cooker more than fits the bill when it comes to what most people want, and the price point is pretty darn great. 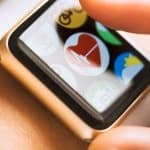 It’s programmable, so you can set the time and forget about it, or you can choose to operate it via temperature probe (measures doneness by temperature). 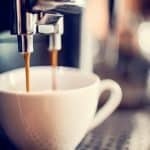 There’s also the option of operating it manually and just setting it at high, medium or low without a cooking time. The Hamilton Beach Set ‘n Forget is 6 quarts, which is the perfect size for most uses. It features sturdy handles and a lid gasket to eliminate spills, as well as a spoon that clips to the unit, all making it great for travel (potluck dinners, etc.). Another great feature of this model is that it will stay on during brief power outages, which is very handy if you live in an area that has frequent power glitches (like mine) during the stormy months. The best price I found for this model was $39.99 on Amazon. Be sure to use these Amazon coupons and offers to save. This slow-cooker is a real looker, and it has the features to back up. Its polished, stainless steel exterior is elegant enough to feature on your buffet table, and it also has an attractive, removable ceramic insert to use that as your serving dish. It holds 6 1/2 quarts, has an easy-to-read digital display, and sturdy handles. One of its best features is that the timer is programmable for up to 26 hours which, according to the All-Clad website, is the longest cook-time on the market. In addition to the standard setting for warm, low and high temps, it automatically switches to a keep-warm setting when your cooking time is up, which is a nice convenience, too. You can find it at Crate & Barrel for $179.00. Just be sure to use these Crate & Barrel coupons, deals and offers to save. As some of you…ahem…older readers like me might remember, Crock-Pot is the company that made slow cookers popular in the U.S. over four decades ago. 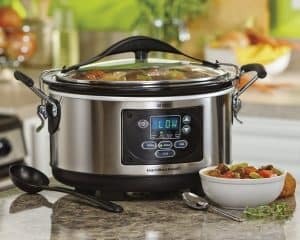 Well, they continue to produce a wide array of excellent, reliable slow-cookers made to meet the needs, and the budgets, of all types of users. 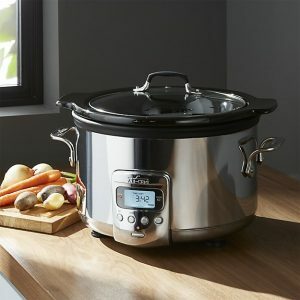 We chose this one as our ideal slow-cooker for those users looking to get a simple, entry-level model and who don’t need all the bells and whistles of the more expensive cookers. It holds 4 quarts and has a removable oval stoneware insert, plus a glass lid. Like I said, just the basics. It’s operated with a single temperature dial which you can set at low, medium or high. This definitely makes it easy to operate, but also means it’s not programmable and doesn’t have a timer. But again, for the user who’s new to the slow-cooking craze, or who just needs a bare-bones model, this one’s your best bet. 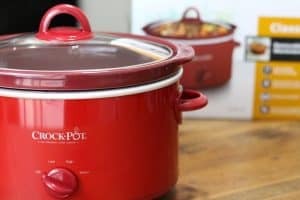 Buy the Crock-Pot 4-Quart Oval Manual Slow Cooker on crock-pot.com and be sure to save using these Crock-Pot coupons, promo codes and offers.